FULL VERSION: ALL GAMES ALREADY UNLOCKED AND READY TO PLAY GATHER YOUR ENTIRE FAMILY AND FRIENDS AROUND FOR 8 FUN, ACCESSIBLE AND ADDICTIVE GAMES. 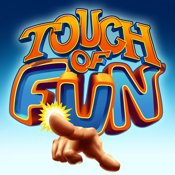 WARM UP YOUR FINGERS FOR SOME JOYFUL HYSTERICAL MOMENTS: 2 TO 4 PLAYERS CAN FACE EACH OTHER ON THE SAME IPAD! 8 FUN-FILLED GAMES TO PLAY WITH: •BURIED TREASURES: Dig through the sand with your fingers to collect the most treasure chests. Everything goes here: you can steal other player’s treasures, hinder their digging etc… •BUBBLE GEYSER: Drag as many bubbles of your assigned color to your side, or pop your opponents' bubbles! •AIR SOCCER: Protect your goal and score with the tip of your fingertips. •SHOOT FOR THE STARS: Control your laser cannon and shoot the stars to score points. •SPLASH PAINTER: Be the craziest painter and cover as much of the canvas as you can. •COOKING MADNESS: Drag your necessary ingredients to your pot to quickly complete recipes. •GHOST CATCHER: Be ready to catch the wandering ghost when he appears to score points. •TOTEM OF FURY: Hit the totem as much as possible without breaking it in this nerve-breaking game. BRING A TOUCH OF FUN INTO YOUR LIFE WITH THE BEST MULTI-PLAYER AND SOCIAL EXPERIENCE ON THE IPAD!